Precious Pets offers an exclusive daycare experience by providing an intimate version of the industrial sized daycares seen today. Unlike the big name chains, we are able to provide the dogs with many plush beds to cozy up in, benches to give them a place to rest off the ground if they need a break from the riff raff and of course, plenty of toys to play with! Perhaps the most important benefit of having your pet in our quaint daycare besides the personal, comfortable atmosphere, is the fact that they are never alone. The individual attention they receive ensures that the needs of each and every pet are being met as they play in our well supervised, safe, enviornment. To ensure the integrity and care of our dogs, we limit the daycare to 35 dogs. Precious Pets now offers cageless boarding in our newly renovated facility. Pets are supervised and cared for 24-hours a day by our loving pet care specialists. They have the run of the entire daycare and play all day with their other boarding buddies. At night, they settle down in the back daycare room where they can cozy up and sleep on the bed of their choice, although, most prefer to cozy up with our loving daycare attendants instead. Of course, if your pet feels safer and more secure sleeping in an enclosed environment, we can arrange for your pet to sleep in his own private quarters as well. 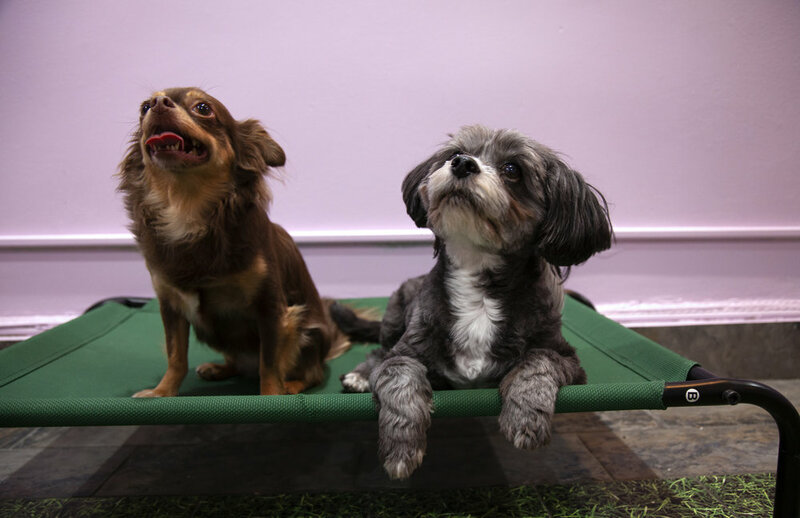 Because our facility is cageless, we can only board dogs that have been socialized (joyously spent time in the company of other dogs) because their days will be spent in the daycare with all the other pups. This can be stressful for a dog who has spent most of his days without other dogs. In case of emergency Animal Medical Center on 62nd Street will provide 24 hour emergency care if needed. Precious Pets is not liable for any medical bills. Must provide proof of pets having their current vaccinations prior to boarding. We prefer you supply us with your pets own food and treats to ensure consistency with their diets.